In 2011 while most were going about their normal daily routine, Tiffany Cloud Olson was thinking of her husband, SSG Erik Olson, a decorated Special Operations combat veteran serving outside the wire in eastern Afghanistan’s Hindu Kush near Pakistan. Based upon insurgent activity in the region, a high probability existed that he would be injured or worse. Olson was not naïve to battle, as prior to Afghanistan, he served two year-long tours with Special Operations in Iraq where he was awarded numerous commendations, among them, three bronze stars, including the bronze star for valor. But despite being a seasoned combat veteran, the risks for him were real, and the fears for her, palpable. As self-imposed therapy, Tiffany Cloud Olson began to write about her experiences as a military spouse lacking sleep, worrying daily, checking the casualty report incessantly, & coping sometimes well (often horribly) while her husband was at war. Her writing evolved into a book entitled Sleeping with Dog Tags, which is now available in major bookstores, Amazon.com, Kindle, Barnes & Noble, NOOK, eBooks, etc. Within its first three weeks of availability, Sleeping with Dog Tags hit Amazon.com’s Best Sellers List in the military bio category (#78) & its highest position on the Top 10 Hot New Releases in the same category (#3). Sleeping with Dog Tags tracks the emotional rollercoaster of a military spouse’s year at home while her husband is deployed in Afghanistan. Central to her narrative is the conviction that while war is hell for the soldiers, it is also hell for family members manning the home front, and there are few supports for those left behind. 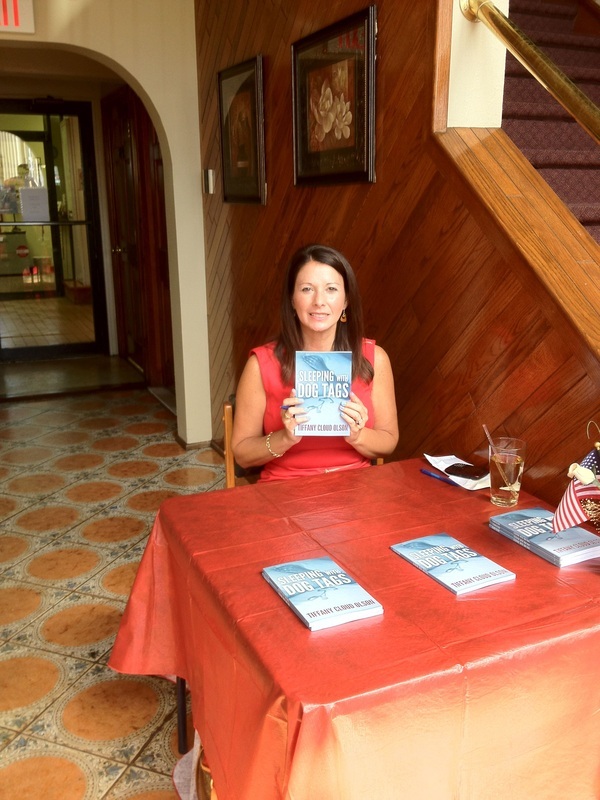 She does not only wish to raise awareness of the military family experience with this book, she also wishes to raise money for an organization benefiting her community. Cloud Olson intends to donate a portion of the profits from Sleeping with Dog Tags to The Rolling Angels for Armed Forces, a motorcycle group that supports military and their families in multiple ways—soldier send offs, return home celebrations, presence at military funerals, and gifts for military children during the holidays, among the many things they do. Amy Crego, Founder of The Rolling Angels, authored the book’s foreword. the WTU process towards medical retirement.